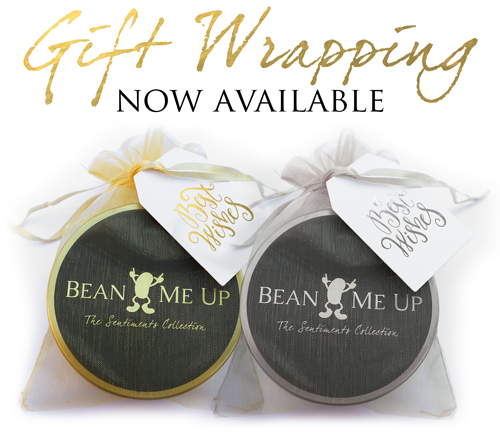 Christmas Magic Beans from Bean Me Up are the perfect, unique stocking stuffer! Laser engraved with 4 different festive designs these are sure to impress your loved ones! Christmas is a time of hope, joy and delight. There’s no better way to celebrate than with the enchantment of magic beans. Plant the beans and fill your home with Christmas cheer as the beans grow and embody the Christmas spirit. The Christmas Collection magic beans are the perfect stocking stuffer. Laser engraved with your choice of designs these are sure to impress your loved ones! The Sentiments collection is a true gift from the heart that your loved ones will cherish. As the plants grow the words Love, Luck, Friendship, Hope, Health and Happiness appear providing the perfect way to show someone you care. The perfect gift for all occasions!